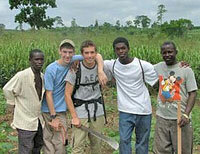 Gap Year Programs, or interim year programs between high school and college, are becoming more popular. Gap year students begin their college careers with purpose, focus and direction. They approach their course work, extracurricular activities, and social lives with heightened maturity. Essentially, gap year students gain perspective and meaning, which equips them to be far better prepared than their peers to take full advantage of everything their college years can offer. Students find themsleves studying politics, the environment, economics and cultures in a whole new way. Oftentimes, the curriculum challenges their observations, encouraging them to form powerful conclusions about the nature of globalization, world hunger, human rights, cultural change, and political systems. We can provide an abundance of programs from which to choose in order to satisfy the interests of those students who wish to pursue this year of personal exploration.